Lead: Chad Guyton. Tenor: Lester Rector. Baritone: Brandon Guyton. Bass: Jayson VanHook. Having won the 1996 Collegiate and 1999 Dixie District Championships, the clamor for a recorded set has been strong. Seeing the Four live at National, it seemed certain they would place top ten. Well, there's always next year. Their robust and hearty delivery is matched by the fullness of their tone. "Bright Was The Night" begins delicately, before swelling into a dramatic coda; "It Is Well" follows a similar strategy. The gentle sway of "Barbershop Style," "Ain't Misbehavin'" and "After You're Gone" are good-natured remembrances of another era. The most stirring arrangement is the gospel flavored "This Little Light Of Mine." The four Christian young men who are Cleveland, Tennessee-based Barbershop group Four Voices won the Gold at SPEBSQSA's 2002 convention in Portland, and "II" shows us all the faith, charisma, humor and rock-solid harmonies that caught the ear of the judges. 12 songs, "No No Nora," "The One I Love," "You Made Me Love You," "Charleston," "Lazybones," "After You've Gone," "My Mother's Eyes," "Muppet Show," "If I Only Had a Brain," "Yes Sir, That's My Baby" and "Lamb of God." You know the kind of barbershop chord that goes on longer than it's possible to hold your breath, and rises to a chord so high and sweet, the hairs on the back of your neck stand up? Four Voices sings those kind of chords--simply the best! Four sweet-harmonizing young Christian men - Brandon Guyton, his brother Chad, Lester Rector and Jayson VanHook, otherwise known as Four Voices, have put their hometown of Cleveland, TN on the Barbershop map. First singing together in Lee University's acclaimed Voices of Lee, the newly-formed quartet turned quite a few heads by winning SPEBSQSA's 1996 Collegiate and 1999 Dixie District Championships and singing well at the Nationals, their first step into the International top ten was winning the Gold at the 2002 convention in Portland! Since then the popular group has toured extensively, taking their distinctive, smoothly blended sound, passionate delivery and exciting arrangements to delighted audiences in concert halls, corporate venues and churches across the globe. "III" follows "Four Voices" and "Four Voices II" not just in order, but in feeling, quality and pure musicality. Favorites among these 12 tunes could easily include them all, but we'll arbitrarily pick the soulful "I Believe," poignant "Nearer My God to Thee," triumphant "How Great Thou Art," Lennon/McCartney's "Oh Darlin'," a light-hearted "Sesame Street" and, in further tribute to their 16-member Collegiate group, "For God So Loved the World," sung with Voices of Lee (lightly guitar accompanied). "III" is simply a beautiful, inspirational album - don't miss this one! 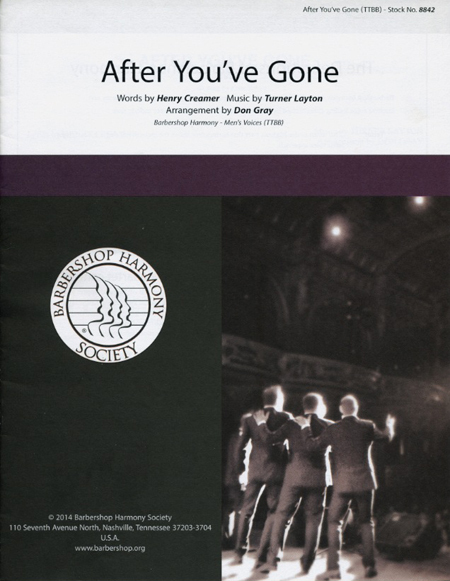 "After You've Gone" is a popular song composed in 1918 by Turner Layton, with lyrics written by Henry Creamer. This classic has been recorded by Sophie Tucker, Bessie Smith, Louis Armstrong, Benny Goodman, Mel Torme, Frank Sinatra and countless other. This is the arrangement performed by Four Voices. A true classic!